Recording Holiday Fun and violence. - You don't know me. What loot did you get? "Some say Mary's playing began to exceed Winifred's when she lost the beehive and picked up the feathered cut. But no matter what the story, it was clear from Winifred's gaze that this Christmas morning was the beginning of the end for The Baker Sisters' Family Fun Duo." I gave her the free iPod touch that came with my laptop in September, I got my dad a williams sonoma certificate and a leather planner, got my sister some fingerless gloves and a vicki's secret certificate, got my friend Esme a wedding planner and my friend Jill some new shoes and jewelry. Well I didn't ask for anything, never really do. That said I got a calendar that came with magnetic poetry, a new phone since I recently lost mine, the collectors edition of the seven samurai and a bok about the worlds worst weapons. I got my dad a book about the chronology of UFO cover ups from 1947 to 1973. "Thelma and Louise would become quite upset when their friends and family told them their rendition of 'Silent Night' sucked, and shortly after this photo was taken began a crime spree." Musical training begins early on the Vulcan homeworld. -"Dad got us these chocolate recorders! Play, then eat!" -They didn't have the heart to tell them they were supposed to blow out, not in. I gave my mom a picture of my brother and I (she only wants that every year). I made my friend Le Tigre a background of Heath Ledger as the joker that says "Some men just want to watch the world burn". I bought my guy key shaped pendants to go with the lock shaped pendant I have. I'll give it to him when he's out of jail. And your guy is in jail? :( You want to talk about it? "Although they looked like chocolate, Esme and Doris were disappointed to discover their recorders were actually just recorders. Doris's teethmarks buffed out eventually." Gave: Glenfiddich Scotch & shortbread to my Dad, a Pierre Cardin Suit to christwithpants (much deserved), a book about friendship to seven_oh_7, wine to my boss, Swarovski crystal to cryttlebugs. Got: Chocolates from work, Davidoff Cool Water perfume & gift set from boss, DAAS DVD from son, LOTR dvds from Dad, a song from madbard. Camera (el cheapo Kodak), Samsung MP3 player (squee), skincare and doona cover. LOL! Awesome! Love the caption! Gave: Schulz and Peanuts by David Michaelis and two pairs of Peanuts/Christmas themed socks to my Mom. Got: $70 dollars in gift cards to WalMart, World War Z by Max Brooks, the season of Firefly, a stuffed dog (named Toto), a Kung Fu Panda Po PEZ dispenser, and various goodies. Today I gave myself: Kissing Sin by Keri Arthur, Urban Shaman by C.E. Murphy, Lasher by Anne Rice, Bitten by Kelley Armstrong, The Vampire Files: Volume Two by P.N. Elrod, Steampunk (a collection of, well, steampunk, and Sweeney Todd in Concert. WOOHOO Sweeney Todd in concert! The only performance by Patti Lupone I've ever enjoyed. lol. I love that concert! It's world-class. My Mom gave me the vhs before she died and I made the mistake of lending it to someone, and she never returned it. I'm pretty broken up about it still. And nice gives, and gifts my dear. And great presents. Except the umm.. perfume sample card? LOL. Reaaaaally? ...and The Giving Tree, to be the first book to read to my unborn, recently kicking, highly anticipated firstborn! LOL! That's like the only song I can play on that. I remember we performed it in like second grade. Haha!! EDIT: And I forgot a 1930's style phone, a CD with wartime music, and a phonebook for my grandparents. @_@ Oy. 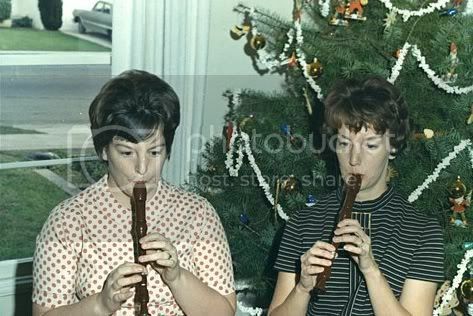 Janet and Claire rushed through the final 3 verses of "Deck The Halls" to try to finish before their ill-thought-out (though tasty) chocolate recorders melted.